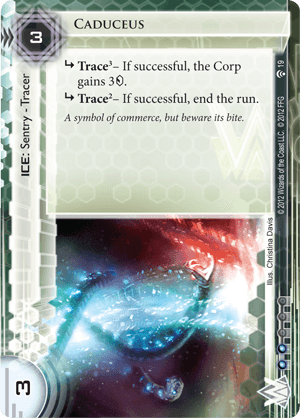 subroutine Trace – If successful, the Corp gains 3credit. An excellent addition to the pool of taxing "econ" ICE that give the corp credits back (Pop-up Window, Errand Boy and Negotiator). The best case scenario when rezzing Caduceus is an early-game face-check, whereupon you will immediately recover the credits spend on it with its first subroutine, and then end the run with its second subroutine. The worst case scenario (barring the runner having enough to make the traces obsolete) is the runner having a Mimic out, which can break Caduceus with 2. Because its subroutines can be broken with breakers or credits (via traces), it should be treated as a porous taxing ICE (like a Pup or Eli 1.0), not a solid run-ender. In this role it performs quite well, taxing 2-4 s if they have a killer out, and probably more if they can't break and have to pay for traces. From a straight rez-cost-to-tax-ratio perspective, Pop-up Window is the clear winner. So why use Caduceus? Influence is the most obvious reason - if you're playing Wayland and don't want to splash for the Pop-ups. However there are other strong reasons to consider Caduceus. At 3 strength, it is considerably harder to brush off the board with a Parasite. Furthermore, it is giving you a stronger tax, but for a bigger upfront cost. This means if you're trying to build a "stronger" server, or just generally already have a strong econ, you will probably get more return from the investment in a Caduceus over a Pop-up Window. It's also a sentry rather than a code gate, so if you aren't already running sentries, it works as an excellent gear-check to force the runner to stop and dig out their killer. Caduceus obviously syngergizes with things that improve or play off your ability to win traces, although this only comes into play early in the game before they have a killer out. If you have recurring trace-buff credits, always use your first 3s to buff Caduceus's first subroutine. If that first trace succeeds, you then effectively get the trace credits back to spend on the second trace (although you could also choose to keep them as permanent credits). Resist the urge to spread your recurring credits between the traces, as that benefits the runner, since they don't have to similarly choose where to invest their (it works on every single trace).